When looking for ways to workout at home for strength, toning or stamina, using weights needs to be simple, easy and hopefully cheap enough to attract the masses. The body pump set and body bar is a simple option for many, if you know what they are. Body pump is different to the body bar in that it is a barbell workout. 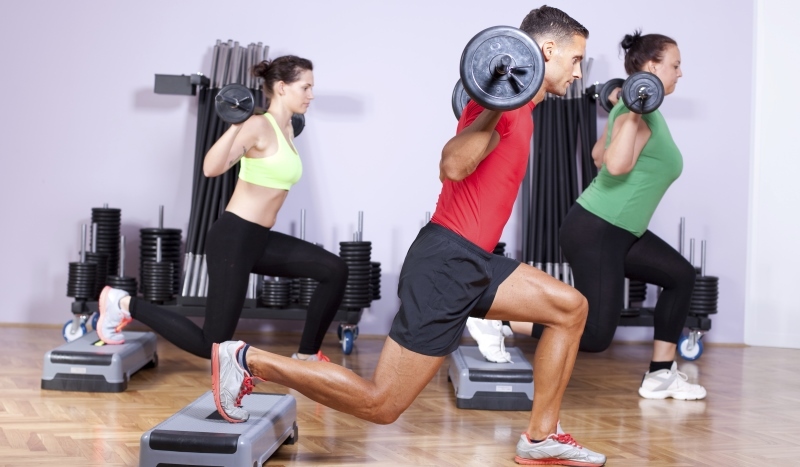 Body pump is all about using light to moderate weights but with lots of repetition. The idea is to combine cardio with strength. The body pump workouts are 55, 45 and 30 minute workouts. The idea is to develop lean muscle and burn calories. Body pump claim that you can burn up to 600 calories in every body pump workout. You can perform body pump at home following the videos or you will find body pump classes in your gym. Most workouts follow the Les Mills routine of a warm up with light weights then followed by an intense workout using the barbell. Each of the major muscle groups are worked in turn including chest, back, shoulders and abdominals. So expect to do squats, deadlifts, clean and press, lunges and bicep curls. You will also probably do push-ups, chest presses, overhead presses and crunches. The music used is usually quite a high temp. This is followed by a cool down and stretch. Can You Lose Weight in a Body Pump Class? Training with weights is a good way to build muscle and as your metabolism is increased so you continue to burn calories way after your body pump class has finished. If you also watch the food you consume you should see more weight loss. For many the main advantages of body pump is that all your muscle groups are targeted and, combined with the music, it can be a very motivational way to workout. Because body pump also follows a strict programme wherever you are in the country you can visit a gym and pick up the progarmme. What Is A Body Bar (Fit Bar)? You may have seen a body bar sitting in the corner of your gym and wondered what it was. This innocuous piece of kit actually has a huge variety of uses. The body bar was first launched in 1987 and is based on a simple piece of kit, a slender 4' pole solid steel weighted fitness bar, encased in rubber. The weight can range from 2kg - 10kg (3lbs - 24lbs). You may also see it referred to as a sculpting bar or sculpting stick. This can be used in the home but there are also a growing number of body bar fitness classes emerging. There are a number of different workouts that can be used with the body bar. They include strength and conditioning, circuits, kick boxing, balance and alignment. This diversity of uses is one of the things that has made the body bar so popular. The big difference though between the body bar and the barbell is that you don’t have to add the weight, it is already weighted for you. Do think about the weight you are selecting. Something may sound light but if you are using it in a cardio workout like kick boxing for example it won’t feel that light! A very rough rule is for beginners to use a bar 3-6 pounds, intermediate, 9-18 pounds, and advanced 15-36 pounds. Body bar Classes can incorporate a number of different exercises. These range from presses, dead rows, curls and dead lifts. In fact you can work your core, back, biceps, triceps, shoulders, inner and outer thigh, all with the one piece of kit. The chest press foe example is a good example of one way to effectively use the body bar. Traditionally performed on a bench you can also do this exercise on the floor with your body bar. Alternate between a set of chest presses and a set of pushups to give your pecs a really good workout. The diversity of the body bar also means it is now used in yoga body sculpting classes. In yoga it is used for core strengthening and for support during balance work. A popular use in yoga for the bar is to hold it aloft whilst holding a pose with arms overhead, in this way it provides resistance to a popular yoga move. This is a relatively inexpensive piece of kit that you can do a huge amount with. You can also easily use it at home or attend a class with one. Many really like it as you don’t need to store separate weights so for a home gym short of space this works really well. As it is also shorter than a conventional barbell it can be held in one hand for one sided moves. Finally, it offers great diversity to all the moves you do anyway and, as we know that boredom is the enemy of all exercise, this is just the thing you need to keep motivated.